For years, methane emissions from the seabed have been observed in the Arctic Ocean off Spitsbergen. The assumption that the warming of seawater by climate change is responsible for the release of methane, has not been confirmed. Re-search from an international team shows that post-glacial uplift is the most likely cause of methane hydrate break-down. The study is published today in the international journal Na-ture Communications. Methane hydrates, also known as flammable ice, occur in many regions of the oceans. But only under high pressure and cold temperatures the product of methane and water forms a solid compound. If the pressure is too low or the temperature is too high, the hydrates decompose and the methane is released as gas from the sea floor into the water column. Spitsbergen has been experiencing severe outgassing for several years. Does the methane originate from decomposed methane hydrates? What is the cause of the dissociation of the hydrates? Warming due to climate change or other, natural processes? An international team of scientists has now been able to answer this question, which has been published in the international journal Nature Communications. “Our investigations show that uplift of the sea floor in this region caused by the melting of the ice masses since the end of the last ice age is probably the reason for the dissolution of methane hydrate, which is already ongoing for several thousand years,” explains Prof. Dr. Klaus Wallmann, first author of the study by GEOMAR Helmholtz Centre for Ocean Research Kiel. “The region has raised more than the sea level has risen, causing a pressure relief, so that the methane hydrates dissociate at the stability limit," Wallmann continues. 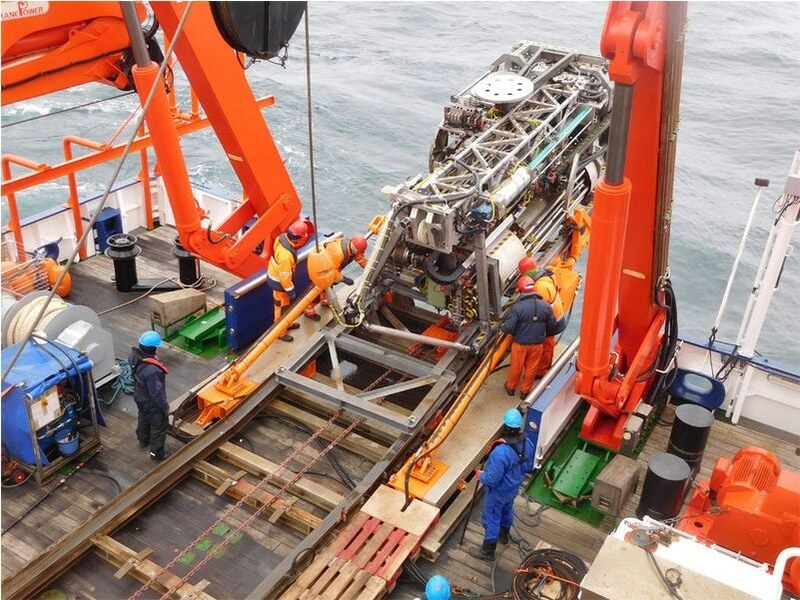 For their investigations, the scientists carried out the expedition MSM 57 with the German research vessel Maria S. Merian led by the Research Center MARUM – Center for Marine Environmental Sciences at the University of Bremen. The mobile drilling rig MARUM-MeBo70 was also used for this study. “With this special device, we were for the first time able to gain long sediment cores in this area,” explains Chief Scientist Prof. Dr. Gerhard Bohrmann from MARUM. “In these cores, we found significant amounts of freshwater that originate from decomposed hydrates,” Bohrmann continues. The scientists were able to prove that this process started 8,000 years ago, thus it cannot be attributed to global warming of the past decades. In addition to the geochemical analyses, results of a model simulation of ice distribution in the Arctic since the last ice age were used. “The results show that the rate of isostatic uplift at our drill sites after melting exceeded the eustatic sea-level rise throughout the post-glacial period,” explains Prof. Bohrmann. “In other words, the land has risen faster and stronger as the sea level rose, so that the pressure in the hydrate reservoir decreased and the hydrates finally became unstable,” adds Prof. Wallmann. Thus, the scientists argue that the dissociation of hydrates can be explained by this process, especially since the warming of sea water in deep layers of the ocean is still low. The investigations off Spitsbergen show a methane release, which is not caused by climate warming. Further research efforts are necessary at other locations to investigate whether this applies also to other areas of the Arctic or even in middle latitudes.